I feel like all the time I'm talking about how to be happier, how to improve your mental health, how to find balance in your life, all those kinds of things, but I forget to mention the simple things. You know that time that you went to the apple orchard with your best friend and took cute Instagram pictures? That moment is just as meaningful as your own personal growth journey, since it makes you happier. This fall, take a second and step away from your busy life (no excuses, you deserve to have some fun every now and then) and stop and smell the flowers. Or the apple cider, both work. Here are 8 fall oriented activities that you can do, some of them by yourself and some with friends, so that you can enjoy your life beyond the daily grind. One. // Learn how to make latte art. Or just fancy lattes! I was scrolling through Pinterest and stumbled upon this gorgeous photo of a cup of coffee with jack o' lantern carved pumpkin latte art. Super cute and also totally fitting with the autumn aesthetic. With cooler weather on the horizon, it's time to enjoy warm drinks, which clearly Instagram and Pinterest is jumping on during this season. While I never fail to swoon at latte art, coffee shops that do it are just so expensive! At home, you can probably learn how to make your own latte art (if you're ambitious) or just learn how to make lattes (for a more reasonable goal). My sister bought a milk frother and we made a ton of tea lattes to try and recreate the deliciousness that coffee shops always have and it's actually not that hard. Experiment with what you can do with hot drinks and maybe even dip into latte art + up your Instagram game with pretty lattes in the process. Two. // Go on a Hike. I'm not a nature person, but a quick little scenic walk or a hike with your friends can actually be pretty fun. A couple weeks ago, I went on a hike with some friends and we actually had a lot of fun. The hike went from a casual, "let's just walk through the woods" and turned into an impromptu adventure to a stream, where we took pictures. Find a local trail near you and invite some friends to get out in nature. Since the weather is cooling down, you don't even have to worry about sweating the whole time and can wear your cozy sweaters and jackets while walking through nature. Okay, this one is pretty obvious and popular (with good reason), but I had to mention it. Whether you head to the pumpkin patch, cider mill, or just hang out in the park taking pictures with the pretty fall leaves and your cute oversized sweaters and boots, this can be a fun and Instagram worthy activity. It can be serious, with you whipping out your DSLR to take some professional looking photos or it can just be you and a few friends snapping some cute selfies on your iPhone. 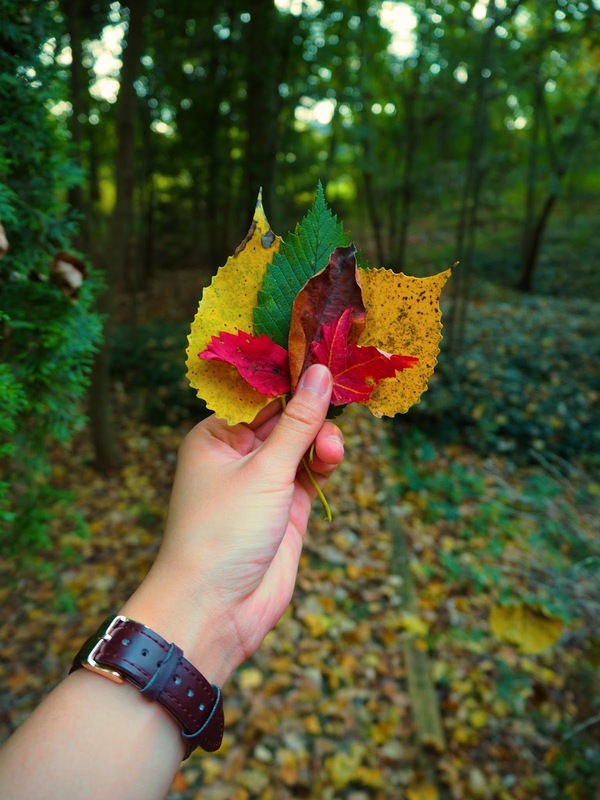 Need some fall photo inspiration? Check out my autumn Pinterest board! While it doesn't explicitly have to be Friendsgiving, you can still have a similar cook-in night where you and your friends make something delicious from scratch and then all sit down for a hearty meal of good food and good conversation. Bonus points if your meal is fall inspired: aka having apple, maple, pumpkin, squash, those kinds of things. If you have a lot of friends participating and want to avoid having too many cooks in the kitchen (figuratively and literally), you can divide up portions of the meal to cook to smaller groups. For example, these two people are in charge of appetizers, those two are in charge of the side dishes, and so on. That way you can avoid a big mess in the kitchen. Oversized sweaters are all the rage for the fall season, but the thing is, I see oversized knit sweaters online in stores that are pretty pricey. Yeah, they're nice, but they're a little bit of budget. While the cheaper sweaters are slightly thinner and not as cozy sometimes, you can still get the best of both worlds. Try thrift shopping for one, which will be easier than shopping for regular clothing because you don't need your exact size if you plan for it to be intentionally oversized. Obviously, what you find will depend on your local thrift store's stock, but you can find some pretty great gems there, even name brand things sometimes! Six. // Go apple or pumpkin picking. This one is kind of an obvious one, but I had to mention it since it's one of my favorite fall activities. Depending on where you live, the produce that is in season may vary. However, apple picking and pumpkin picking are generally the cornerstone for autumn. It's a fun activity that you can do with friends and/or family. Make a pie, make caramel apples, carve a pumpkin, there are tons of things that you can do with your fresh picks. Seven. // Make homemade applesauce. With said apples from activity number seven, whip up some homemade applesauce. Apple pies are overrated. Instead, I like to make my own applesauce. It's so much better than the storebought ones and is super easy to make. It's super easy + you can't really mess it up like you could with a pie. I usually improvise a recipe, just putting in chopped apples (any green apple is perfect for applesauce), water, cinnamon, and brown sugar as necessary. If you like to adhere to recipes, here's one for applesauce that's super simple and also low-effort. Eight. // Arm knit. Or actually knit! Again, bringing it back to Pinterest, I've been seeing so many pictures of big chunky blankets and sweaters for the autumn season, so why not get a lil crafty and make your own? I've been seeing these chunky blankets that you can knit with your arms, aka easier than actually knitting and way faster, that I definitely think would be fun to make this fall. Here's a link to some tutorials on arm knitting a blanket. Full disclaimer, I've never actually done arm knitting before, so it might turn out terrible, but I think it looks interesting! It's something that can be done with friends (blanket making party!) or alone while watching Netflix. If you can actually knit and have some extra time, I think that knitting is something great for while you're watching Netflix or something, you can make something for the fall. Hats are a pretty fast thing to knit, but the easiest thing would probably be a scarf, it's just super time consuming. Make it a long term project! 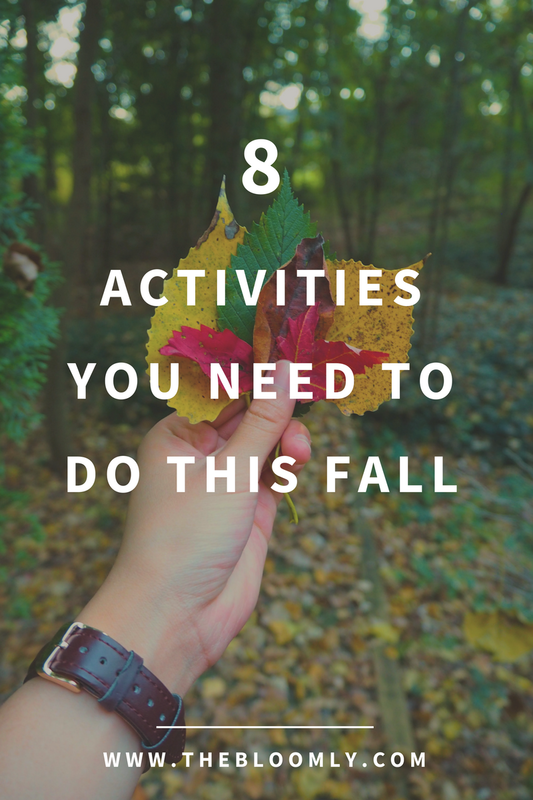 What fun activities do you like doing in the fall? I love arm knitting!! I picked it up last year and actually gifted quite a few to family for Christmas! That's such a great idea for gifts! I'll have to try it out sometime!